Lent has just begun and Pope Francis has spoken to Rome’s clergy, commenting on the ‘ages’ of priesthood. 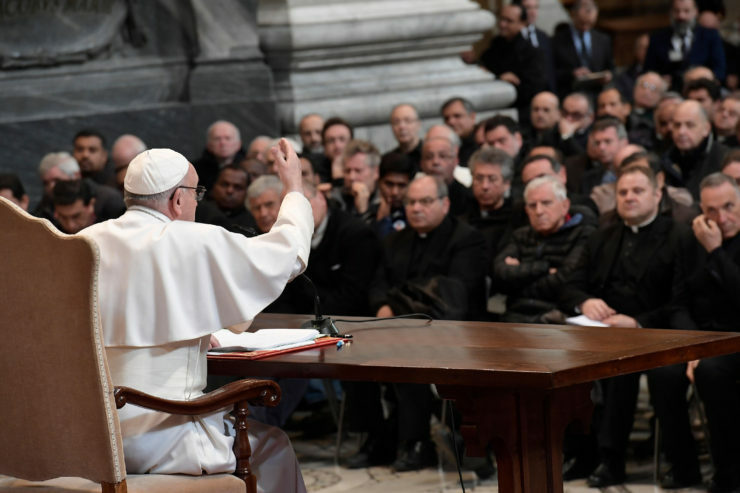 The Holy Father did so during a closed-door meeting the morning of Feb. 15, 2018, with the clergy of the diocese of Rome, on February 15, 2018, held in the Basilica of Saint John Lateran. On his arrival in the Basilica, the Holy Father heard the confessions of some priests. After the greeting of H.E. Monsignor Amgelo De Donatis, Vicar General of His Holiness for the Diocese of Rome, the Pope addressed the priests present. I will try to say something on the questions you asked me, the questions posed by the group. Some priests prepared questions that I took to Pope Francis and now he illustrates them, according to the different ages of priests: so, those that are young, those that are older and up to the age of the elderly. This is the question – so many questions in one question! But I was pleased that there are so many, because there is something in common in these questions: there is the abundance of circumstances. If this is like this, and that is like that. And so and so . . . : questions of circumstance. The accent is on the circumstances. “When this happens, if things are like this and are like that and go like this, how can one cope with these circumstances that are limitations, which don’t let us go forward?” In face of these circumstances or with so many circumstances, there is no way out. It’s a trap. When circumstances become so strong, it’s a trap. It’s a trap because it doesn’t let you grow, it’s looking too much at the circumstances. Instead, the right way is key to live the priestly commitments, and to look for the style that helps to offer in peace and fervour. Let’s leave aside the circumstances, which are so many, but let’s look at how to go forward. I’ve said the word “style”: to seek one’s own priestly style, one’s priestly personality, which isn’t a cliche. We all know how a priest should be, the virtues he must have, the path he must follow . . . But the style, your identity card . . . Yes, it says “priest,” but yours, with your personal stamp, with the motivations that push you to live in peace and fervour. On one hand, so many circumstances in this world that are like this, like that, like this . . .; on the other, your style. Each one of us has his own priestly style. Yes, the priesthood is a way of living, it’s a vocation, an imitation of Jesus Christ in a certain way; however, your priesthood is unique, in the sense that it’s not the same as another’s. I would say, in face of these questions: seek your style. Don’t look so much at the circumstances that close the exits. Seek your style: your style as priest and <your> personal <style>. And this style moves in an atmosphere. I would like to say this: it’s not a cliche to continue to say that we will not be able to live the ministry with joy without living moments of personal prayer, face to face with the Lord, talking, conversing with Him about what I’m living. This isn’t a cliche. [To live] the ministry with joy, with moments of personal prayer, face to face with the Lord, to talk with the Lord, conversing with Him what I am living — the circumstances, your own style, to the Lord. Do I talk of this to the Lord? All these questions? Or do I talk with myself, with my impossibility in face of so many circumstances that close the door and drag me down? “Ah, it can’t be done, it’s a disaster . . . , one can’t be a priest in this secularized world . . .” And the complaints begin, the limitations. The question says: “How are the desires and the aspirations, the limitations also involved? “ This is a beautiful question: how are limitations involved in your priestly vocation, in your style. Identify the limitations: the general ones – the fact that I’m here – and also your personal ones. Dialogue with the limitations, in the sense of what can I do with this limitation, how <can I> bear this limitation. Discern among the limitations. And the question can scare us because there are so many limitations, so many circumstances that drag us down and “I can’t be a priest.” No! The answer is: there is a way; it’s your priestly style, the dialogue with your limitations, the discernment of limitations also with these circumstances. Don’t be afraid of this. Discern also your own sins, because sins are forgiven, it’s true, the Sacrament of Confession is for this; but it doesn’t all finish there. Your sin is born of a root, of a capital sin, of an attitude, and this is a limitation, which must be discerned. It’s another way, different from asking forgiveness for a sin. “No. Yes, I have this problem, I went to confession, it’s finished.” No, it’s not finished. The forgiveness is there, but then you must dialogue with that tendency, which has led you to a sin of pride, of vanity, of jealousy, of gossip, I don’t know . . . What leads me to that? Dialogue with the limitation I have inside, and discern. And the dialogue with these limitations, always – must be ecclesial – must be done before a witness, with someone who helps me to discern. And there, confrontation is so important: to confront this, which happens to me, with another. The need for confrontation, not so much for sins, I’d say that it’s necessary to make a distinction here: sins are to be confessed and to ask for forgiveness, and the thing ends there; then, I go forward with the Lord. However, the limitations, the tendencies, the problems that lead me to this, the spiritual sicknesses I have, this yes, I’ll never be able to overcome this or solve the problems that lead me [to sin] without the confrontation, the confrontation. And here it’s about finding a wise man, a wise man. It’s the ecclesial figure of the spiritual Father, which begins with the desert monks: the one who guides you, who helps you, who also dialogues with you, who helps you in discernment. If you have sinned, this is a limitation, it’s true: look for someone who is merciful and, if he is deaf, <all the> better. Ask for forgiveness and go forward. However, the thing doesn’t end there. What led you to sin? What is the tendency, what is the problem? Look for a wise man for the confrontation, to dialogue with the limitations, with one’s weaknesses, to dialogue and try to resolve the way. I tell you truthfully: the priest is celibate and in this sense one can say that he is a man alone; yes, one can say it up to a certain point. However, he can’t live alone, without a companion on the way, a spiritual guide, a man who helps him in the confrontation, in discernment, in dialogue. It’s not enough to confess one’s sins: this is important, because there – and I have always felt it, is one of the most beautiful things of the Lord – there is the humility of the sinner and the mercy of God that meet and embrace; it’s a most beautiful moment of the Church, that is, the forgiveness of sins. But it’s not sufficient. You are responsible also for a community, you must go forward, and that’s why you need a guide. I say to you not to be afraid, also to young people: begin as young people with this. Seek. There are wise men, men of discernment who help so much, and who accompany so much. Therefore, summarizing: on this question, there is too much accent on the circumstances, and this can become an alibi, because if you only look at the circumstances, there is no way out. You must seek your own style, the right way to live your priestly vocation; and for this, it’s not an old thing, it’s not a cliche to continue to say that we won’t be able to live the ministry with joy without living moments of personal prayer, face to face with the Lord, talking, conversing with Him about what we are living. These things must be taken to prayer with the Lord. Without dialogue with the Lord, you can’t go forward. 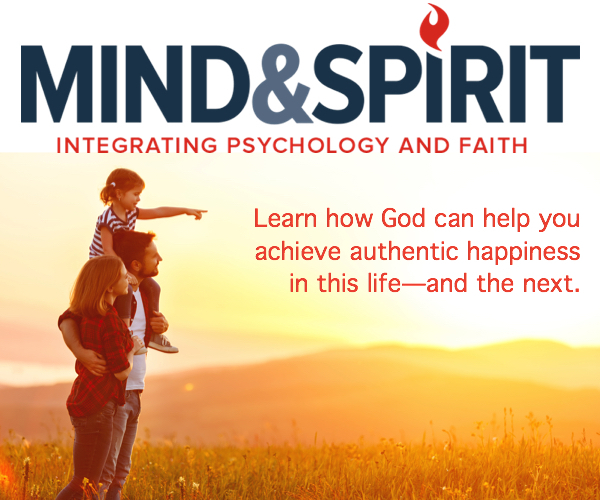 Dialogue with your limitations, discern the limitations and for this, help yourselves in a confrontation with a spiritual Father, with a wise man who helps you in discernment. And young people help here so much – and they do so! – this is also a plus, and even adults do it – small groups of priests who accompany one another: priestly fraternity. They meet, talk and this is important, because loneliness doesn’t do one good, it doesn’t do one good. This is what comes to mind on the first question. However, I would like to stress this: be careful not to get embroiled with the limitations. “Oh, it can’t be done, look at this, that, the world is a calamity, this, that, the television, this , that . . . “ they are cultural or personal limitations, but this isn’t the way. The way is the other I’ve said, and the Lord Jesus always at the center, prayer <at the center>. We pass to the second question: ”For a priest, the age that goes from 40 to about 50 years is decisive. Often moralistic perfectionisms fall, one is [experientially] conscious of being sinners – and this is very good about that age. So many apostolic ideals are re-dimensioned , the support of the family of origin fades, parents get sick, often even one’s health begins to cause problems. It’s a propitious time to choose the Lord, but often we don’t have the instruments to re-orient the middle age crisis – this one is called so – toward a joyful and definitive choice. The super-work – sometimes is suicidal – the dispersive super-work has made us unaccustomed to take care of ourselves precisely in the moment in which we have greatest need. Father, can you give us some indications in this regard? How can one prepare for this stage of life? Which are the indispensable helps? Um, the noon demon! The midday demon . . . In Argentina we call it the “cuarentazo.” At forty, between forty and fifty, this happens to one. It’s a reality. I’ve heard that some call it “now or never.” One rethinks everything and[ one says] “now or never.” There are two writings that I know – which are so beautiful, of the Desert Fathers, you will find in the Philokalia so many things on this –: there is a modern book, closer to us, also a dialogue with psychology, of that Austrian monk psychologist Anselm Grun, The Middle-Age Crisis, this can help. It’s a spiritual-psychological dialogue on this moment. And there is another written book, this one, yes, I’d like all to read: The Second Call, by Father Rene Voillaume. It would be lovely to give this, somehow, to priests. It’s a beautiful exegesis of Peter’s vocation, the last, at Tiberias: Peter of the second call. As the Lord called us the first time, He calls us continually, but strongly the first time. Then He accompanies us, calling us every day, but at a certain point of life, this becomes a second strong call. It’s a moment of many temptations; it’s a moment in which one needs a necessary transformation. One can’t continue without this necessary transformation, because if one continues this way, without maturing, taking a step forward in this crisis, one will end badly; one might end in a double life, perhaps, or leaving everything. One needs this necessary transformation. There are no longer those first sentiments: they are distant, I don’t feel them like those I had as a boy, to follow the Lord, the enthusiasm . . .” these have gone; there are other sentiments. There are also other motivations, not those. And it happens – because this is a human problem – as it does in marriage: there is no longer a falling in love, entering in love, in the youthful emotion . . . things have calmed down, they go another way. However, this one does remain, something we must seek inside: the relish of belonging. This remains. The pleasure of being together with a body, of sharing, of walking of struggling together: this, in marriage and also for us. Belonging. How is my belonging to the diocese, to the presbytery? . . . This remains. And we must become strong in that moment to take a step forward. As for spouses: they have lost all that was most youthful, but the relish of conjugal belonging, this remains. And what must one do there? Look for help, immediately. If you don’t have a prudent man, a man of discernment, a wise man to accompany you, look for one, because it’s dangerous to go on alone, at this age. So many have ended badly. Look for help immediately. Then, with the Lord: say the truth, that you are somewhat disappointed because that <first> enthusiasm has gone . . . However, there is the prayer of donation: to give oneself to the Lord, a different way of praying, donation. It’s a rough moment, a rough moment, but it’s a liberating moment: what has passed, has passed; now there is another age, another moment of my priestly life. And I must go forward with my spiritual guide. The time that remains of life, is to live it better, for a better donation of oneself. It’s the time of children – I like to say it thus –, to see the children grow. The time to help the parish, the Church, to grow, it’s the time of growth, of children. It’s the time that I begin to diminish. The time of fruitfulness, true fruitfulness, not feigned fruitfulness. It’s the time of pruning: they grow, I help and I stay behind, helping to grow, but they are the ones <who grow>. And there are such awful temptations in this time, temptations that before one never thought one would have. There’s nothing to be ashamed of, they are temptations: it’s the tempter’s problem, not ours. There is nothing to be ashamed of, but they must be unmasked immediately. And it’s also the time of childishness, when the priest begins to do childish things. They are the seed of a double life. They must be picked up immediately and also with a sense of humor: “Behold, I who thought I’d given my life totally to the Lord, but look, how bad I look!” I said it was the time of fruitfulness. What figure comes to my mind? Childish things, double life . . . but, but that which comes to me more, taking it from the family, to describe the priest who unable to overcome this, to mature in this time, is the figure of the “bachelor uncle.” Bachelor uncles are good, because – I remember – I had two, who taught me bad language, gave us hidden cigarettes , always . . . but they weren’t parents; they weren’t parents! It’s the time of fruitfulness: with sacrifice, with love, this is a lovely time, it’s a time . . . It’s the second act of life. The first act is the act of youth, but this one takes you to the end. Don’t lose this opportunity to mature in this time of pruning, of trial, of different temptations . . . The time of fruitfulness. It can also happen that they come at this time – because the devil is astute – some temptations of one’s early youth, but they come isolated. Don’t get scared. “But look, Father, at this age . . . Well yes, son, go on!” They make us be ashamed, but are proper of this time; we thank the Lord who makes us be somewhat ashamed. But don’t stay there! No,that’s a circumstance, the thread goes on the other side: the pruning, the fruitfulness and the time to guard the good wine, so that it ages well. And I would also say that it’s the time of the first goodbye, the time when the priest realizes that one day he will say goodbye definitively. And this is the time of the first goodbye. Many “goodbyes” must be said in this time” “Bye, I won’t see you again.” This will never happen again, this situation, this way of feeling the things, which I won’t have any more. Goodbye to this part of life, to begin another. And thus we learn to take our leave. There comes to mind, and this makes one laugh, because I <wrote> a Motu Proprio in these days that begins with these words: “Learn to take your leave.” It’s for those that at 75 must tender their resignations. However, it is meant to learn to take one’s leave, because we’ll have to do so one day. It’s a science, a wisdom that must be learned over time, which is not improvised. This is what I would say, like this, somewhat disorderly, on this second question of the “midday demon.” However, try to read Father Voillaume, The Second Call; also the other one, Grun’s is good, but Voillaume is a classic. It’s curious: Voillaume is a spiritual author who became a classic still in life, one of the few who was already classic, he died very old, but was classic when he was still in life. This one is that of the Vicar. I’m well! So many of us are at this age. Let’s say the truth: it’s the last stage of life. The midday crisis has passed and this one comes. And in this age one can’t find the proper language of today’s world. I don’t know how to use the networks and these things . . . no, not even the mobile phone, I don’t have a phone. I don’t know. I don’t know how to use that language. The Internet and these things, I don’t know how to use them. When I have to send an e-mail, I write it by hand and the secretary does it. One might not have the ability to use the new technologies; one might not find the pastoral methodology that is needed today. This is true; it’s an experience. Today the reality goes so far ahead, that I’m unable to do it. However, the most important thing at this age is what can be done: what people need today. And this age – that of before was one of pruning; perhaps the first of all was that of hope, of having all one’s life before one – and this one, instead, is the age of the smile. To offer a kind look, and this can be done; this can be done. How beautiful it is when confessors receive a penitent with this kind look. And immediately, the heart of the penitent opens, because he doesn’t see a threat. It’s a look that welcomes the person, a kind look — this in regard to the confessor. However, so much good can be done at this age with the Sacrament of Reconciliation, so much good. I believe that in past years some <persons> gave me that book of the confessor: Don’t Tire of Forgiving. The Sacrament of Reconciliation at is one of the most beautiful ministries that can be done. One can be available – a new availability: “Yes, of course . . . can you do that thing? Yes, go ahead . . . “ It’s the age of the priesthood of multiple use. One can have the closeness, the compassion of a father. Elderly priests, who know life, are close to human miseries, close to sorrows. They don’t speak too much but, perhaps, with a look, with a caress, with a smile, with a word they do so much good. One can listen so much, there are so many people that need to talk about their life, to speak, To listen; it’s the time of the ministry of listening, the pastoral of the ear. And today people are in need of being heard. Then, the fruit, whatever it is, but: “I found a man who understood me.” Perhaps the priest doesn’t realize he has understood him, but he received that person in such a way that . . . It’s the time to offer unconditional forgiveness. Grandparents are able to forgive, they have wisdom. The confessor of that book – he was a Capuchin friar –, sometimes had the scruple that he had forgiven too much. He came to me at 80 – now he is 92 and has a queue of people, which doesn’t end – and he said to me: : “But, do you know, I have this problem, I don’t know . . . You tell me, as Bishop, what I should do” – “And what do you do when such a scruple comes?” I said. I knew him, I knew he was clever . . . And he said to me: “Well, I go to the chapel and I look at the Tabernacle, and I say to the Lord: Excuse me, Lord, today I’ve forgiven too much. But mind you: it’s You who gave me the bad example. And this is wisdom: unconditional forgiveness. What thing can you also do? Give witness of generosity and joy. The witness we see in the elderly: the testimony of “good wine,” generous and joyful. And you can give good humour, a sense of humour. A good gift, if one who knows how to relativize things in God, but with that wisdom of God. The figure that comes to mind is the Father of the parable (Cf. Luke 15), who relativizes everything: the son begins his discourse and <the Father> embraces him, doesn’t let him speak, forgives him. However, the son knows that there is great strength there. It’s the time of grown up children and of grandchildren. A priest has grandchildren. Not nephews, no, because there is that saying which states ”to those that God doesn’t give children, the devil gives nephews,” — no, grandchildren. It’s lovely to see elderly priests play with children: they understand one another; they understand one another. And here I come to a topic that I consider very important; that passage of Joel, chapter 3, verse 1, gives me so much strength: “The old men shall dream dreams, and the young men shall prophesy.” It’s the time of this joy in the relationship with young people. And this is one of the most serious problems that we have now. We are still in time, because it’s about giving roots to young people. It’s curious: young people understand themselves better with the old than with the parents, because there is [in young people] an unconscious search for identity, for roots, and the elderly give give it to them, the grandparents do. But <this matter> of generosity, of the “good wine” helps them so much: it’s the dialogue with grandchildren, with young people. And what is the greatest temptation of this age? To return to some temptation of youth. I don’t know if this expression exists in Italy, but in Spain, it exists in Spanish, and the same in Argentina: it’s the moment of the “green old man” [“viejo verde”], namely, the immature old man who returns to the temptations of his youth. It’s awful, it’s the defeat of a life: to end up an immature “green old man” . . . And they make fools of themselves . . . They feel themselves the eternal fiances — fools. I’m not speaking of priests. However, a priest can fall into this temptation of returning to the temptations of youth. It’s an awful thing, to end this way. I return to the dialogue between the elderly and young people: it’s a meeting of generations. The evangelical passage of the presentation of Jesus in the Temple is clear; it’s very strong and gives us so much light. Young people are in need of roots, today, when this very virtual world, a virtual culture without substance that rips off the roots or doesn’t make them grow; it makes them lose. And this is an urgency of the time, to which elderly priests can respond: to help young people find the roots, to rediscover the roots. And the influence is mutual, because when some youthful group — I have in mind some experiences — goes to play the guitar, for instance, in a Rest Home, in the beginning the elderly are somewhat [hesitant] but then they begin to move, enter into dialogue, begin to dream — as Joel says. And these dreams make it so that the young people go out differently, differently. What I say isn’t poetry; I believe it’s a revelation of the Lord for our time. It’s a special vocation for us, priests, who are in this age – with young people, to be dreamers with young people. Discern the Signs of the Times. This is what Jesus reproached the Doctors of the Law of for not knowing how to do, because the reality always hides something of the sublime: to see the reality, not to be afraid of the reality. The reality, — I like to say –, is greater than the ideas, always. The reality is superior to the ideas. Don’t be afraid of the reality. Yes, there is behaviour, even moral conduct, that we are not used to seeing. We think only of matrimonial life: today many don’t get married; they prefer to live together. And how do I take this reality? How do I accompany it? How do I explain it and help it to mature and to go forward? I don’t know. It’s a pastoral reality that we can’t forget or leave aside. And what do I do so that this couple, that love each other, take the step towards great spiritual maturity? Or how do I respect this? There are challenges, but there are also good realities. And on this there comes to mind an article of an Argentine priest that is entitled “The good things of living in this time,” [by Victor Manuel Fernandez]. There are good things in this time; there aren’t only calamities. There aren’t only negative realities: there are good things. And he makes one see some <of them>: a greater consciousness of human rights and of one’s dignity. Today no one can impose ideas; today people are more informed; today so much value is given to equality; today there is more tolerance and also freedom to manifest oneself as one is; today social coexistence is more sincere, more spontaneous; today there is great appreciation for peace; the human value of solidarity has also come up . . . And thus, so many good things that are in the world of today and that we must take up. And try not to be scared of the difficulties, of the “new values” – new values in quotation marks. Things are so: what can I do with this? That thing has this that is good; that one isn’t good . . . discern. Discern the signs and take up what can be taken forward, help others. I don’t know. These are the things that come to mind. I don’t want to close in the negative but, please, to young people: don’t get lost in the circumstances but go to the kernel; to those of middle age: don’t fall into “childishness”; to those of our age, older, of maturity: please don’t be “green old men”; and to all: in dialogue with today’s world, discern the signs of the times and the good things, the things that come from the Spirit. It’s true, the world is sinful in itself and makes so many things worldly, but perhaps the kernel comes from the Spirit and one can take this. Discern thoroughly the signs of the times. I thank you for your patience, for listening. Now, before the blessing, we thank Pope Francis for this very intense, beautiful moment this morning, and we receive a small text in which are gathered meditations from Paul VI to Pope Francis: they are readings to use in this Lenten Season as a second reading of the Breviary, so that the commitment of prayer can be common. And we reflect a bit on what our Bishops have consigned to us in these years precisely on the priestly life. I think it will do us good, because then this will prepare us for other passages we will live – I hope – in the future on further reflection of our being priests in Rome today. Now the Prefects can take the texts, <and> distribute them, and then we’ll receive the blessing. I’ve seen it and I liked it very much. There are two Bishops of Rome [recently] now Saints [John XXIII and John Paul II]. Paul VI will be a Saint this year. One with his Cause of Beatification underway, John Paul I, whose Cause is open. And Benedict and I, on the waiting list: pray for us! And please pray for me!. Thank you so much.